We spend a third of our lives in bed! So it stands to reason that our bedrooms should be luxurious sanctuaries in which to let the stresses of the day melt away. A relaxing bedroom space is a must for busy lives and that sense of tranquility doesn’t just come from the decor. Whilst the overall design of the room is tremendously important for creating a relaxing atmosphere with color schemes, lighting and furnishings are all essential factors to think about when designing your sleeping space. Beds take up lots of room in a bedroom. They not only take up lots of actual space, but visual space as well. That’s why a beautifully made bed can make the whole room look amazing! 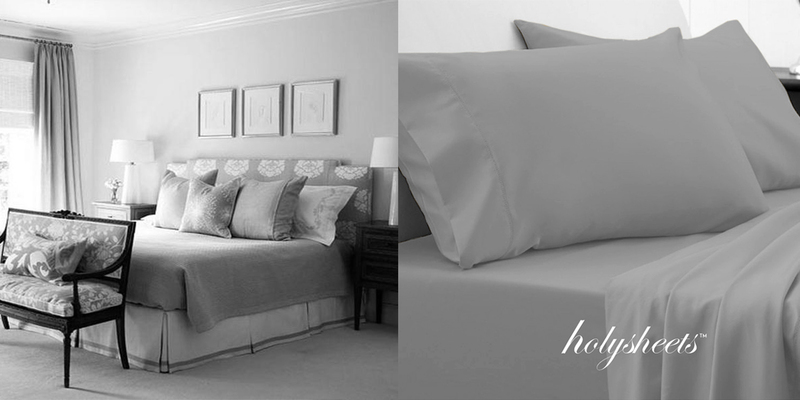 Designers know this and use bed linens like this Holysheets set to their maximum potential! A fabulously made bed can make the whole room appear updated and chic and beautiful, even if the rest of it is very ordinary! And layering bedding really amps the up the wow factor even more! Once you start mixing and matching sheets, blankets and pillows, the stylish combos are endless. Check out HGTV Magazine’s winning combinations of 15 pretty pieces to play with. There’s not a snore of a bed in the bunch and can all be intermixed with our amazing Holysheets 1500 Collections. Going For A Modern Look? Start with our Light Grey Holysheets set and start building. The set gets you started with a flat sheet, fitted sheet, and two pillowcases and has the modern contemporary look you may be in search of. Looking for something a bit more lively or colorful? Click here to shop all our colors. Let us know in the comments what your favorite designs and looks are. Holy Sheets is EVERYTHING you need! Check out our NEW Holy Sheets Commercial! Holy Sheets Town Square Grand Opening! Robert Deniro Impersonator DeNiro Guy at HolySheets Las Vegas!